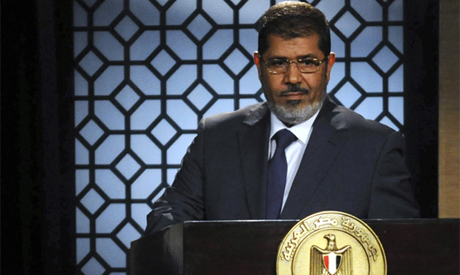 In a surprise move Thursday, President Mohamed Morsi issued a new Constitutional Declaration. The declaration began by stating that the January 25 Revolution had mandated the president with the responsibility to achieve revolutionary demands and to root out remnants of the old regime from Egypt's state institutions. It also called for the building of a "new legitimacy built on a constitution" to promote "principles of freedom, justice and democracy." Ahram Online provides a translated version of Thursday's Constitutional Declaration. Reopen the investigations and prosecutions in the cases of the murder, the attempted murder and the wounding of protesters as well as the crimes of terror committed against the revolutionaries by anyone who held a political or executive position under the former regime, according to the Law of the Protection of the Revolution and other laws. Previous constitutional declarations, laws, and decrees made by the president since he took office on 30 June 2012, until the constitution is approved and a new People’s Assembly [lower house of parliament] is elected, are final and binding and cannot be appealed by any way or to any entity. Nor shall they be suspended or canceled and all lawsuits related to them and brought before any judicial body against these decisions are annulled. The prosecutor-general is to be appointed from among the members of the judiciary by the President of the Republic for a period of four years commencing from the date of office and is subject to the general conditions of being appointed as a judge and should not be under the age of 40. This provision applies to the one currently holding the position with immediate effect. The text of the article on the formation of the Constituent Assembly in the 30 March 2011 Constitutional Declaration that reads, "it shall prepare a draft of a new constitution in a period of six months from the date it was formed” is to be amended to "it shall prepare the draft of a new constitution for the country no later than eight months from the date of its formation." No judicial body can dissolve the Shura Council [upper house of parliament] or the Constituent Assembly. The President may take the necessary actions and measures to protect the country and the goals of the revolution. This Constitutional Declaration is valid from the date of its publication in the official gazette. Morsi has no choice but to get rid of Mubaraks old guard in the Judiciary who continue to stand in the way of the democratically elected parliament. Mubaraks judicary dissolved all the elected MP's and have forced Morsi's hand. If he want to clear Egypt up, he has to make these changes otherwise Mubaraks Judiciary will continue what their doing. Mohamed Morsi will soon loose all credits from the USA he will be even worse than Assad or Hitler The islamist brotherhood did put this shame on it self and can never be trusted. They don t know democracy what so ever I hope Allah wil let his Airplane crash if he goes to the Usa! Egyptian shouldn't diluted by who are ignoring popular will, desperately try to prevent completion of the Constitution for flimsy reasons, and fight for the goals of the revolution, but bet on its enemies. I try to follow what is going on here in Egypt closely, as I consider Egypt my home now. At first I was quite shocked at this news. But...giving it more thought, is it possible that this new declaration by President Morsy, is his only way to finally rid the Judiciary of members who have been very ONE SIDED in all their rulings? There has not been one real conviction in all of the trials so far, to bring justice for those killed and injured during the revolution and after. How can this be!? I truly hope that President Morsy has taken this very dramatic step, for no other reason, then to finally bring some JUSTICE to those who deserve it. Constitutional court is a Mubarak tool. The truth is that the constitutional court is a Mubarak tool to fight the Islamists. It must be dissolved immediately. The Constitutional Court could and should declare this vey declaration unconstitutional. The democratic movement then must raly behind the decision, that should also contain the dissolution of the current constituent assembly, so-called. If this does not happen, Egypt depends on an enlightened despot to institute civil democracy. Could that happen? Yes, but not likely. Mr. Morsi is inded enlightened and pragmatic. Fine. But he has a constituency to serve as well. With all the power formally in his hands, in fact he loses power with respect to his constituency. Yesterday's results were great. Today's not so.